Magzhan Shamiev, an athlete from the "Shardara armsport" club, became one of the winners of the championship. "I train all year round. I give myself a break only a week after the Worlds and Professional World Cup. Since these tournaments are the most important for me, I am completely immersed in the training process and give all of me in training. 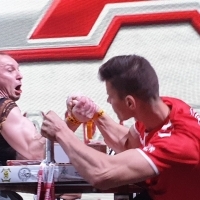 I train only specialized for arm wrestling. I have neither time nor strength for something else". "Championship of the Republic of Kazakhstan took place in our home town. I trained five times a week and spent in the gym for five hours. I really wanted to show a good fight and a good result. I did it. In the category up to 80 kg, I took the first place without any problems. The second was my teammate, two-time world champion Shynbolat Raikhanov. I also fought in the open weight class, in which the first three places were taken by representatives of our club. Medet Kuttymuratov became a champion, Professional World Cup medalist in 2016. For me, the most difficult was the fight with the current world champion in the category up to 100 kg Georgiy Dzeranov. Georgiy is very strong athlete, but I gave 100% in that fight, and I managed to win, and I am very happy". "We want to take part in the Arnold Classic-2017, but we were refused a visa. Now we are preparing for the Asian championship, which will be held in mid-June in Kyrgyzstan. Almost the entire team will be represented by athletes of our club. I have already started preparing for this tournament and will pull in the category up to 80 kg". "For me, the most important event of the year is the World Championship and the Professional World Cup Zloty Tur. I plan, as well as last year, to pull at these tournaments in the categories up to 75 and 78 kg, respectively". Soon, in the next two weekends interesting national championships - the championship of Ukraine (11-13.03, Kharkov) and the championship of Russia (16-18.03, Protvino) will take place. To know all the news stay with us and stay tuned to armpower.net.